Yesterdays press conference, held on Northbourne Avenue, where Minister Corbell announced the costings for Bus Rapid Transit and Light Rail from Gungahlin to Civic has probably not delivered to the Government the response it was seeking. It was probably seeking universal endorsement for its Bus rapid Transit option. Instead, dodgy figures have been exposed and questions are being asked. The problem with the report costings are that they are overinflated and not in comparison to other light rail builds. Yes - there is extra expense involved in acquiring light rail vehicles and depots, but the costings also fail to include figures for the extra buses that would be required to meet the service levels the government claims it will deliver. Misleading rhetoric will not win your argument Minister Corbell. The second problem is that although the ACT Treasury, the ACT transport bureaucrats and the ACT Government LOVE BUSES - no one else does. They can patiently explain BRT all they like to the public and deliberately skew figures to make it appear 'cheaper' but it is wasted effort. The public listens and then says - thank you, but we want light rail. This is also the outcome of every report they commission - which also says that light rail is the best outcome for Canberra. Ultimately the figures are only one part of the public discourse. The real decision is a political one. You can have your say on this issue. Contact your local MLA and tell them that you want Light Rail. 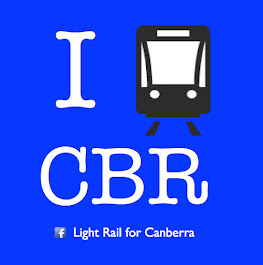 Contact the candidate running in your electorate at the next Assembly election and tell them that you want Light Rail. Ask them what they are doing to bring that about.